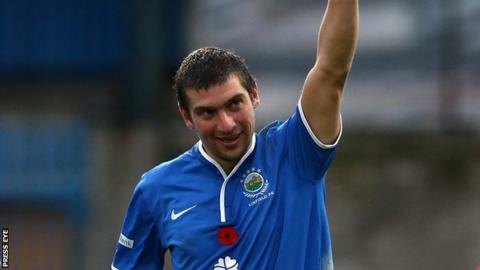 Matthew Tipton has agreed a one-year contract with Ballymena United following his release by Linfield last week. Ballymena manager Glenn Ferguson said the Welsh-born striker, 33, would "add a new dimension to the team". "Having spoken to him at length, he is really up for a fresh challenge," added the Ballymena boss. "We are delighted to get someone of Matthew's ability and proven goal scoring record." Tipton said that he was "delighted" to sign for the Braidmen and was "really looking forward to working with Spike and all the team". Tipton joined Linfield in May 2012 after starring for Portadown but the striker's Windsor Park stint was affected by injury. The former Portadown striker was put on the transfer list by Linfield a year ago but then remained at the club last season.